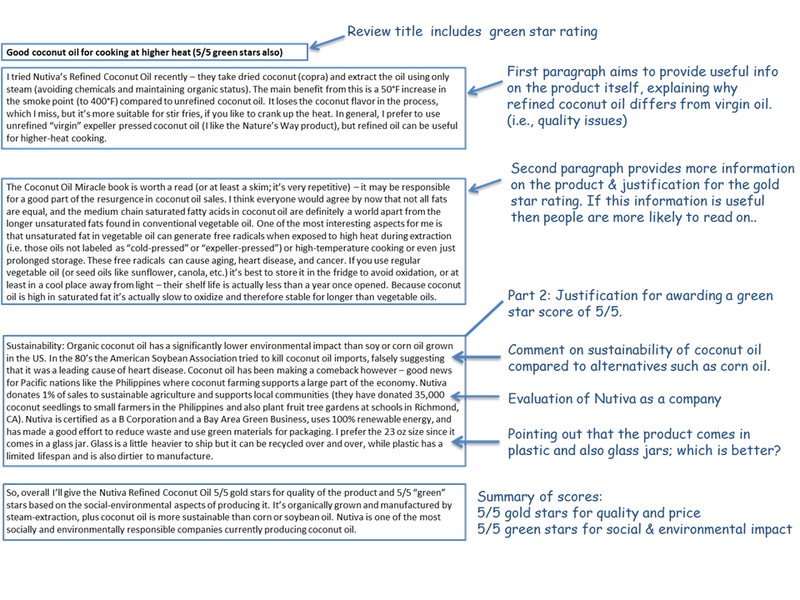 Here’s another review that serves as an example of how to incorporate both gold star and green star ratings. You can see more examples here. The review below is picked somewhat randomly and, like all our example reviews, it’s not an endorsement or an ad for the product. Below the review there’s some more detail on the information sources. We often don’t include citations (i.e. the information sources) in the review since they tend to clutter it too much. Readers can research the topics themselves if they want to know more. You can see the review as posted on Amazon here. You can read more about Nutiva’s own claims on social and environmental impact in their annual CSR (corporate social responsibility) report here. Energy Savings: We switched from 20% renewable energy from utility provider PG&E to 100% renewable energy via the Marin Clean Energy program. When coconuts trees get abundant rainfall, are organically grown, and are harvested with minimal mechanical inputs (like the coconuts we source), they have a much smaller environmental footprint than corn or soy harvested annually in the U.S. This is true even when taking into account shipping from Asia, since carbon emissions from marine container shipping are 32% to 55% more efficient than rail transportation according to a 2011 study by Herbert Engineering Corp.
Actually, in the second quote Nutiva claim that the coconuts they source have a smaller environmental footprint than corn or soy without backing this up with a reference. They provide a reference only for the transportation cost (emissions from shipping versus rail). Having looked into it a little, however, I do tend to agree that organic coconut palms (as long as they are not replacing sensitive habitats) are more sustainable than water, fertilizer, and pesticide intensive crops such as conventional corn and soy. Nutiva donate 1% of sales to support sustainable agriculture. They provide a list of their grant recipients in their csr report above. Nutiva is a also a certified B Corporation. Companies with Benefits – the New Yorker. Their social and environmental performance must be regularly certified by a nonprofit called B Lab, much the way LEED buildings have to be certified by the U.S. Green Building Council. Overall, the product doesn’t hit every single target – for example it isn’t Fair Trade certified, although Nutiva do support local farmers in various ways. But it does, in this reviewer’s opinion, rank in the top 20% in terms of social and environmental impact, which translates into 5/5 green stars. You may differ on your rating, and that’s the whole point – we need a consensus based on several opinions. Start reviewing now! Posted in Anatomy of a green stars review	B Corpcoconut oil footprintethical consumerism examplesis coconut oil sustainable?marin clean energy programNutiva coconut oilNutiva corporate social responsibilitysocial and environmental impactsocial impactsustainabilitywhat is a B Corporation?